This upcoming BASHCon, I will be hosting a Netrunner tournament. If you haven’t heard of BASHCon, it is a weekend long gaming convention held in Toledo, Ohio from February 19th to the 21st. We take over the Student Union at the University of Toledo for three days of gaming, nerd culture, and having fun. More information can be found at http://www.ut-bash.com/?q=bashcon. Entry fee will be $10 and all of that will go to Gamers Outreach. Don’t worry though, we will have plenty of prizes for the top 32. Various prizes include 3 copies of alt art Scorched Earth, alt art Gabrielle Santiago, plastic noise/personal evolution, and much more. To enter BASHCon, you will have to purchase a day pass or a weekend badge. This event will start around Noon on Saturday, February 20th, 2016. The duration and number of rounds of Swiss will depend on how many people attend but don’t wait til the last minute, the event will be capped at 64. Please bring a deck list or arrive 15 minutes early to fill out your deck list. If you have any questions at all, ask away or shoot me a private message on here. Join us at BASHCon 31 as we raise money for Gamers Outreach, a charity that raises money to help children who are hospitalized with gaming. You can read more about them at http://gamersoutreach.org/. Edit note: this was to add that you will need to purchase a badge to enter Bashcon and the tournament. I’ll be there with some others from Columbus and Cinci, looking to sweep my second Toledo charity event and help contribute to the cause while I’m at it! I’ve created a facebook event to help me keep count of how many people to expect until we fix the minor issue we are having with our registration system and to also keep people updated on any new information. The registration for BASHCon events and this tournament have been updated. 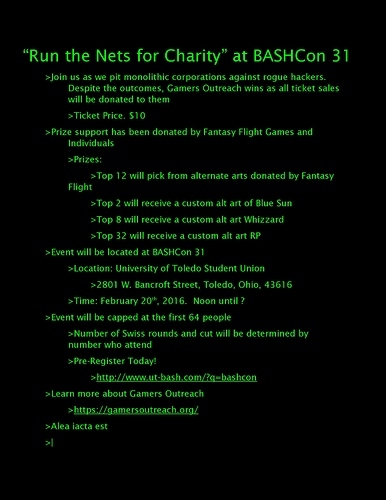 You can now pre-register for the Run the Nets for Charity event along with any other events that may catch your eye. Don’t forget that you will also have to purchase a badge for the convention with discounts offered to university students. If there are any questions, please ask away. 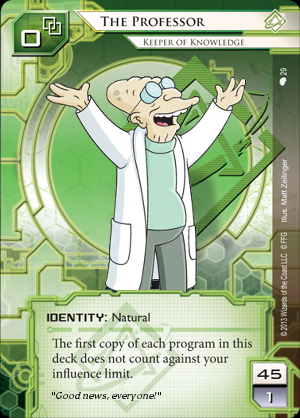 We have the alt arts for the tournament. Pre-registration for the event and badges are still open til the end of this week.